The celebrity wedding expert shares her tips for creating one-of-a-kind invites. Sharon Naylor: Ceci, e-invites are so fast and easy, why do you think more bridesmaids are sending print invitations these days? Ceci Johnson: Today, there is a wonderful return to personalization and attention to detail. Bridesmaids are going the extra mile for their girlfriends [the brides-to-be], and want to show they truly care for them. 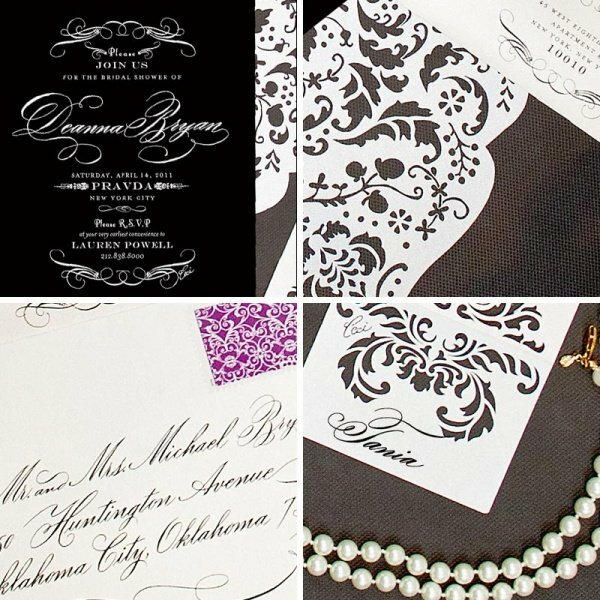 By sending a pretty, formal invitation through the mail instead of an online invitation, you show that you went to great effort to design them, and you provide a gorgeous keepsake for the bride. It's something she can frame and keep in her home or scrapbook to be reminded of the thoughtfulness that her dearest friends put into her special day. Also, it shows the invited guests that the hosts know etiquette and proper manners—always a great impression to make—and that this shower is an event not to be missed. It's important to keep this tradition alive and give it the respect it deserves! Email just shows you're lazy. SN: When bridesmaids come to you for invitation design, what are some of the top things they’re requesting? Spring: Sophisticated Asian inspiration, incorporating peonies, cherry blossoms, butterflies and birdcages. Glitz and Glamour: Hints of an old Hollywood star vibe, mixed with a fabulous evening on the town. Parisian and Old World European: A return to classic elegance with wonderful damask detailing and ornamentation all around. Coco Chanel: Think black-and-white sophisticated elegance. It's perfect for the "non-bridal" bride-to-be. SN: What are the most popular invitation styles right now? Single-panel invitations? Traditional dual fold? What are you really loving right now in this category? SN: What are the most wonderful invitation paper and card stocks? What looks elegant, but is really affordable? SN: What are the top invitation colors and color combinations right now? CJ: Metallics are always popular and stand the test of time. I'm loving champagne gold foil. For showers, you tend to see brighter, more fun colors like teal and pinks. I'm known for my daring use of color and have created a helpful tool to help brides and bridesmaids find their event colors called Ceci Color Stories. Click on any of the color palettes and see it come to life in a real event, then make it your own!